Quickly turning into ol' reliables of the neo-thrash circuit, SKELETONWITCH make next to no modifications to their turbulent speed routine for their fifth album, "Serpents Unleashed". 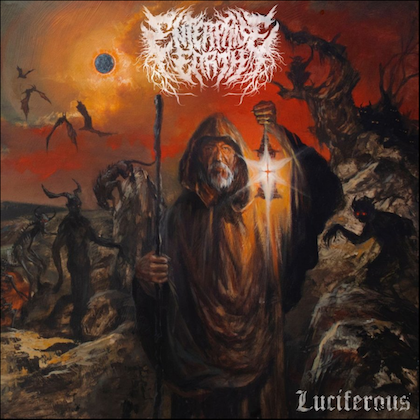 If you've heard their 2007 breakout "Beyond the Permafrost" or their previous recording, "Forever Abomination", then you'll find little, if any, surprises to "Serpents Unleashed". 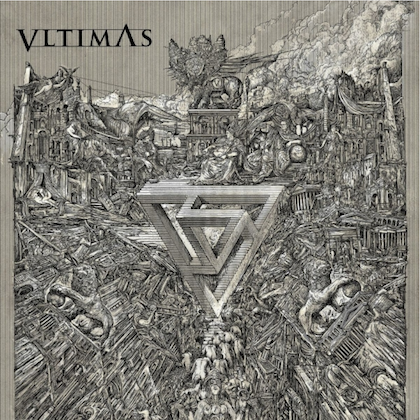 Consider this one more of the same restless intensity and spiraling precision that decorate the band's customary blends of black, death and power metal methods. Because SKELETONWITCH plays at such a demanding pace, they've historically had the good grace to relegate their albums to thirty to thirty-six minutes' running time. 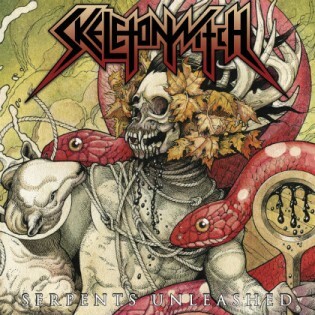 At thirty-one minutes for this round, "Serpents Unleashed" somehow manages to throttle SKELETONWITCH's listeners with zero mercy and still leave an inescapable wanting by the end. Same as they've ever done. Eleven songs banging away at top flight with modified-mosh recesses that hardly rob the album's blazing integrity. 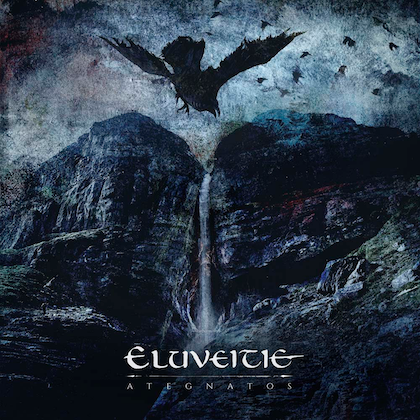 Only the dominantly mid-tempo, power-meets-black metal march of "The Evil Embrace" avoids thrashing things up, and still, the song manages to dish out gratuitous double kicks from former DEMIRICOUS and FOREVER ABOMINATION drummer Dustin Boltjes. Within seconds of play, the title track socks audiences in the puss with fierce velocity that grows even more tenacious with random blast patterns. How SKELETONWITCH continues to efficiently squeeze in moshing slowdowns between the unholy speed here and on the subsequent tracks, "Beneath Dead Leaves" and "I Am of Death (Hell Has Arrived)" is remarkable. Considering the constant reeling effects SKELETONWITCH dishes up from their uncompromising thrash modes, the fluid changeovers hardly feel like impediments. "From a Cloudless Sky" and "Burned from Bone" go to the next level and stay nearly at full thrust as Chance Garnette spools his best Stygian hisses, while Scott "Scunty D". Hedrick and Nate "N8 Feet Under" Garnette shred gleefully along. Bassist Evan "Loosh" Linger plucks away in equally rapid measures behind his front line. On the guitar solo sections of each song, Linger's back notes dance up and down in response to the scaled-back tempos. The striking intro march to "Unending, Everliving" may fool newer listeners into thinking this one's keeping itself hung upon a straightforward power groove. That becomes an afterthought once the song quickly rockets away, decelerating only enough on the bridge to give a momentary chance for listeners to breathe before scampering once again. The guitars are stellar and gusty, stopping abruptly on the edge of a chord cascade that's hoisted right back into action with "Blade on the Flesh, Blood on My Hands". Finally, the tranquil intro to "More Cruel than Weak" is an appealing, sprawled set-up to the jettisoning chaos that ensues thereafter. Once again, SKELETONWITCH shows how to justly carry the old-school banner forward with their surmounted mastery of prevalent metal techniques, old and new. "Serpents Unleashed" is cast with a whipping cadence that uses interchange as a furtherance instead of a disadvantage.